Maximize capability by turning a single USB 3.0 slot into a Gigabit network connection and 3 port USB 3.0 hub. Simpler connection of multiple USB devices, with increased spacing between USB ports. Added length of USB 3.0 cable provides more convenience in extending USB connection further away from PC or Laptop vs typical USB dongle adapters. Compact and portable, the USB 3.0 hub can be powered through USB. Support Windows XP, Vista, Win7, 8/8.1 (32/64 bit), Windows 10, Mac OS 10.10.x or higher, Linux. NOT support ARM-base OS and Lenovo Yoga 2 Pro. 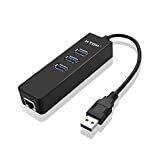 The SM005EU USB 3.0 Gigabit Network Adapter turns a single SuperSpeed USB 3.0 host connection port into an RJ45 Gigabit network port as well as three additional USB 3.0 hub ports. On top of Gigabit Ethernet connectivity, the adapter also adds three USB 3.0 hub ports to your system, which allow you to connect external storage or other USB peripherals locally to the host computer. This entry was posted in Computer Hosting and tagged 10.10.x, Adapter, Ethernet, Gigabit, Linux, Network, Port, Superspeed, USB3.0, Windows by Host That. Bookmark the permalink.